I find it fascinating that different cultures have similar recipes, especially when they involve not-so-simple techniques. The other day, Isaac and I made paneer, which, it turns out, is a lot like making ricotta. Did they teach each other? Did somebody in each country accidentally drop lemon juice in their boiling milk and say, “hey….”? I’ve been reading my Indian cookbooks (those by Julie Sahni and Madhur Jaffrey), and I was excited to come across recipes for rabadi. This is milk, boiled and then simmered for quite some time, until it becomes a lovely, slightly sweet pudding-like consistency. It’s thick and creamy and tawny. It’s very delicious! And the method of making it is quite similar to dulce de leche, except that you don’t add sugar, so it’s not as caramel-y. How did people discover these things? That if you whip egg whites they become stiff, or that if you cook milk for hours it becomes a comforting pudding? I like the simplicity of this dessert. It’s really just milk! 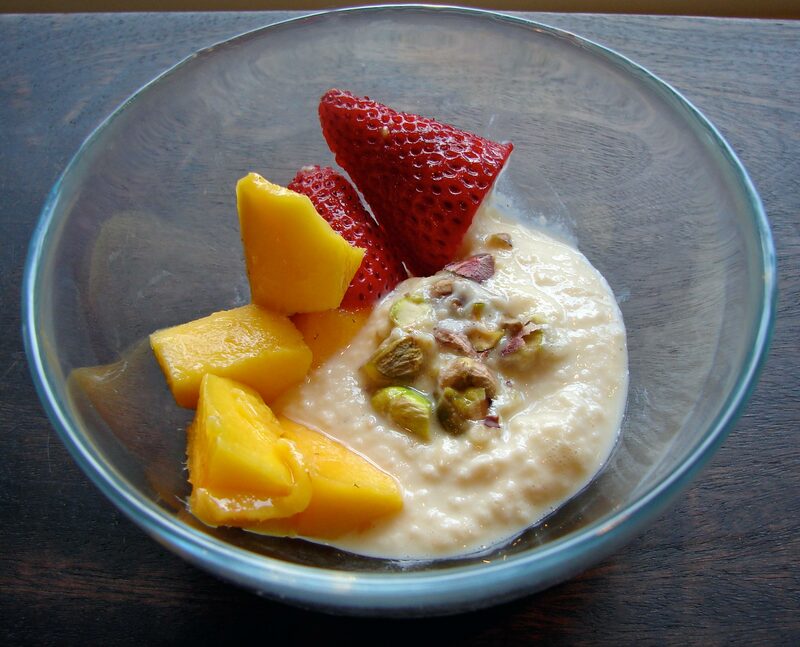 I added a tiny bit of cardamom, and a few spoonfuls of sugar, and that was it – it was delicious by itself, but it was even nicer with some perfectly ripe champagne mangos, some pretty strawberries, and a handful of roughly chopped salted pistachios. This is a nice dessert for summer time, because you serve the rabadi chilled, and it’s perfect with whatever fruit is ripe. The next day I blended the leftover rabadi with the leftover mangoes and pistachios, to make a delicious thick frothy drink. And here’s the perfect song for this! Hot Milk, by Jackie Mittoo. He’s the best! You want to reduce the milk to 1/4 of it’s original volume, so if you start with 4 cups (as I did) you’ll end up with 1 cup of rabadi. Bring whole milk to a boil, then turn it to medium low and simmer. I tried to keep mine at a very low boil. You don’t have to stir constantly, but you want to stir frequently. If a skin forms, stir it in. Keep scraping the bottom and the sides of the pan. It took about 1 1/2 hours, I think – I lost track! This is a good thing to make when you’re doing something else around the house, because as long as you can return and give it a stir every 5 minutes or so, it can just be left. Towards the end I stirred more frequently. Once it starts to turn brown you’re pretty much there. Apparently if you reduce it even further, it will become like fudge. I haven’t tried this – yet. I used a saucepan with measurements inside, so I knew when it got to be a cup. At this point I stirred in about 1/4 t. of cardamom and 2 T of raw sugar. Then I whisked it a little, to make it slightly less lumpy. It will still be lumpy, but pleasantly so, like rice pudding or tapioca pudding. Put it in a bowl and cover and store in the fridge till you’re ready to eat. It will thicken as it cools. 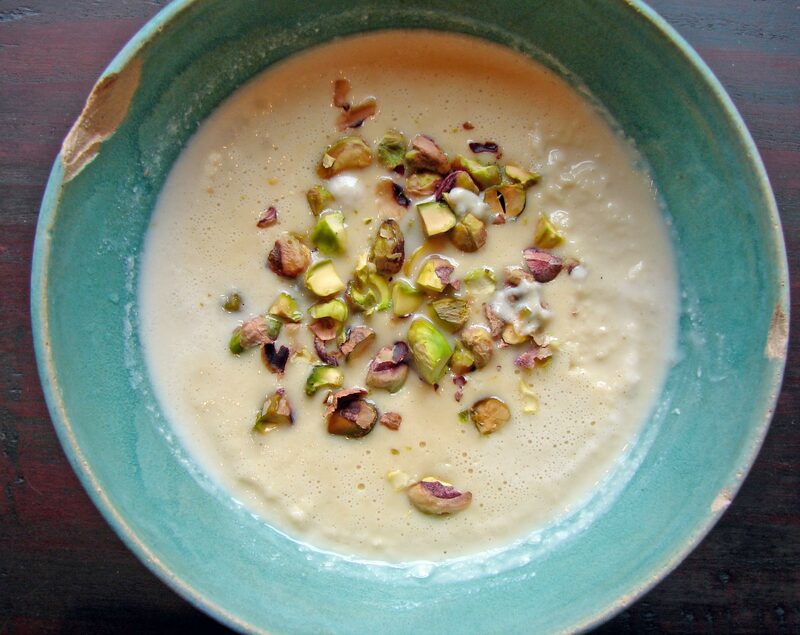 This entry was posted in dessert, recipe and tagged cardamom, champagne mango, milk, pistachio, pudding, rabadi by Claire. Bookmark the permalink.